Biliverdin, a prospective recyclable antioxidant and one of the most important precursors for optogenetics, has received growing attention. Biliverdin is currently produced by oxidation of bilirubin from mammalian bile using chemicals. However, unsustainable procedures of extraction, chemical oxidation, and isomer separation have prompted bio-based production using a microbial cell factory. In vitro thermodynamic analysis was performed to show potential candidates of bottleneck enzymes in the pathway to produce biliverdin. Among the candidates, hemA and hemL were overexpressed in Corynebacterium glutamicum to produce heme, precursor of biliverdin. To increase precursor supply, we suggested a novel hemQ-mediated coproporphyrin dependent pathway rather than noted hemN-mediated protoporphyrin dependent pathway in C. glutamicum. After securing precursors, hmuO was overexpressed to pull the carbon flow to produce biliverdin. Through modular optimization using gene rearrangements of hemA, hemL, hemQ, and hmuO, engineered C. glutamicum BV004 produced 11.38 ± 0.47 mg/L of biliverdin at flask scale. Fed-batch fermentations performed in 5 L bioreactor with minimal medium using glucose as a sole carbon source resulted in the accumulation of 68.74 ± 4.97 mg/L of biliverdin, the highest titer to date to the best of our knowledge. We developed an eco-friendly microbial cell factory to produce biliverdin using C. glutamicum as a biosystem. Moreover, we suggested that C. glutamicum has the thermodynamically favorable coproporphyrin dependent pathway. This study indicated that C. glutamicum can work as a powerful platform to produce biliverdin as well as heme-related products based on the rational design with in vitro thermodynamic analysis. The online version of this article ( https://doi.org/10.1186/s13036-019-0156-5) contains supplementary material, which is available to authorized users. Biliverdin, a tetrapyrrolic pigment, is a product of heme catabolism that consists of several isomers such as biliverdin IX alpha (α), beta (β), gamma (γ) and delta (δ) . Especially, biliverdin IXα, which is typically known as biliverdin, has been considered to be a novel recyclable antioxidant for humans . In human bodies, glutathione is recycled in the glutathione cycle to protect water-soluble proteins from reactive oxygen species (ROS), and biliverdin protects lipids from ROS as a component of the biliverdin-bilirubin cycle . Biliverdin is gaining interest in many medical fields including research on antiviral agents , inflammation regulators , and medicine for lung graft injury  or liver ischemia reperfusion injury . Moreover, it has been recognized as an important precursor of various chromophores for phytochromes used in material sciences , optogenetics  and synthetic biology . Current methods to produce biliverdin are related to the chemical oxidation of bilirubin that was extracted from mammalian bile [11, 12]. These methods raised some problems such as environmental disruption, impurity, and isomer production. In contrast to chemical processing, bio-based production using microbial cell factories has been considered as a rational source for the production of medicines, materials, fuels, and a broad range of chemicals . Biliverdin is biologically produced via the heme biosynthesis pathway. Heme, a direct precursor of biliverdin, is an important material for living organisms; therefore, the heme biosynthesis pathway is active in most organisms. The heme biosynthesis pathway is composed of almost ten enzymes in two forks . The first fork aims to produce 5-aminolevulinic acid from amino acids such as glycine or glutamate. One route of the first fork is the C4 pathway that directly condensates glycine and succinyl-CoA in mammals, birds, and fungi . Another route is the C5 pathway, which starts from glutamate using glutamyl-tRNA synthetase, glutamyl-tRNA reductase, and glutamate-1-semialdehyde aminotransferase in most bacteria, archaea and, plants . The second fork aims to produce heme from coproporphyrinogen III via two different pathways. The protoporphyrin dependent pathway uses protoporphyrin IX as a frame for heme, but the recently discovered coproporphyrin dependent pathway utilizes a coproporphyrin III chassis for heme . A few biological production methods of biliverdin using E. coli have been suggested, but the yield was low despite the constant addition of nitrogen sources such as yeast extract or peptone . Furthermore, there have been some efforts to produce phycobilins using mammalian cell or E. coli but titers were too low due to the low accumulation of biliverdin, the precursor of phycobilins [9, 19, 20]. Thus, it is necessary to develop another strategy for efficient bio-based production of biliverdin. One of the attractive biosystems in synthetic biology is Corynebacterium glutamicum which has been used for the industrial production of amino acids such as glutamate or lysine . It has already been recognized as an efficient biosystem to produce various compounds such as chemicals, fuels, and materials for healthcare . Even though C. glutamicum had the limelight for production of 5-aminolevulinic acid which is intermediate in biliverdin biosynthesis pathways, studies on the production of other tetrapyrroles were limited . There are some advantages to use C. glutamicum which is known to have the C5 pathway and protoporphyrin-dependent pathway for biliverdin production. It naturally produces large amounts of glutamate, the first intermediate of the C5 pathway. Moreover, C. glutamicum contains native heme oxygenase which can produce biliverdin from heme . However, there are no enzymes that can produce isomers of biliverdin such that additional separation methods are unnecessary, unlike current approaches [11, 12]. Additionally, it is generally regarded as a safe (GRAS) gram-positive bacteria which is appropriate for producing pharmaceutical products such as biliverdin. Recently, the rational design of microbial cell factories has become increasingly important due to the abstruseness of the control of carbon flow in microorganisms . Push and pull engineering is one of the methods for the reasonable design of microbial cell factories . Push engineering overexpresses enzymes that act as a bottleneck for pushing carbon flow to produce plenty of precursors, and pull engineering aims to pull carbon flow to targeted final products by strengthening terminal enzymes. This method is commonly based on previous studies about each enzyme related to the pathway, but in vitro thermodynamic analysis has considerable potential as an alternative way to find bottlenecks in the pathway [27, 28]. In vitro thermodynamic analysis calculates the Gibbs free energy of each enzyme in the path and represents hypothetical rate-limiting steps . In this study, we developed C. glutamicum platform strains for the efficient production of biliverdin. A push and pull strategy with in vitro thermodynamic analysis was used because of a convoluted and unrevealed heme biosynthesis pathway (Fig. 1a). Push and pull modules were constructed after the investigation of candidate genes. Moreover, a combination of modules through modular optimization and the addition of biotin enabled the production of biliverdin in C. glutamicum. Finally, fed-batch fermentations were performed using 5 L bioreactor for the scalable production of biliverdin. 8 l-Glutamate + 2 AdoMet + 8 ATP + 8 NADPH + 6 Fdred + 12 H+ + 6 O2 → Biliverdin + 2 l-Methionine + 2 5'-dAdo + 8 AMP + 8 PPi + 8 NADP+ + 6 Fdox + 3 H2O2 + 11 H2O + 4 NH3 + CO2 + CO. The calculated ΔG0′ of the overall reaction was − 2661.39 kJ/mol and it was expected to be a highly thermodynamically favorable pathway when enzymes related to bottlenecks were overexpressed (Fig. 1b). Among candidates HemA, HemL, and HemH analyzed through in vitro thermodynamic analysis, HemA and HemL are used eight times to produce biliverdin but HemH used once (Table 1). Based on these data, hemA from Salmonella typhimurium and hemL from Escherichia coli were selected as rational components for push modules. Especially, hemAM (mutated hemA) that contained additional lysine near the N-terminus was used for the prevention of the degradation of hemA by heme . To identify the effect of overexpression of hemAM and hemL, HM002 strain that contains pEKEx2-hemAL and pMTZ vectors in C. glutamicum ATCC 13826, known as a glutamate overproducing strain, was constructed. The HM002 strain showed similar optical density at 60 h, but the specific growth rate was decreased to 0.14 ± 0.01 h− 1 compared with 0.24 ± 0.03 h− 1 of control strain, HM001 (Fig. 2a-b). Even though HM001 produced little or no porphyrins, HM002 produced 6.29 ± 0.78 mg/L and 2.91 ± 0.11 mg/L of uroporphyrin III (UP) and coproporphyrin III (CP), respectively (Fig. 2d-e). Moreover, the HM002 strain produced 15.59 ± 0.79 mg/L of heme (HM), a 5.48-fold increase compared with control strain HM001. According to the thermodynamic data, we anticipated accumulation of protoporphyrin IX because of the highly positive ΔG0′ of hemH, which converts protoporphyrin IX to heme (Table 1). However, protoporphyrinogen IX and protoporphyrin IX were not detected. Therefore, we speculated that overexpression of hemN was required to strengthen carbon metabolic flow to protoporphyrin IX for heme production rather than coproporphyrin III, which might not act as a precursor of heme in C. glutamicum. Since the amino acid sequences of the hemN from C. glutamicum ATCC 13826 are the same as that from C. glutamicum ATCC 13032, we used the hemN from C. glutamicum ATCC 13032. As another part for the push module, hemN was cloned into a pMTZ vector and expressed in C. glutamicum ATCC 13826 with hemAM and hemL. This HM003 strain showed a slightly increased specific growth rate (0.16 ± 0.01 h− 1) and optical density at 60 h (54.03 ± 2.73) compared with HM002 (Fig. 2c). However, it could still not produce any protoporphyrinogen IX or protoporphyrin IX. In addition, even heme, uroporphyrin III, and coproporphyrin III were decreased to 11.81 ± 0.83 mg/L, 2.08 ± 0.49 mg/L and 1.30 ± 0.02 mg/L, respectively (Fig. 2f). 8 l-Glutamate + 8 ATP + 8 NADPH + 6 Fdred + 12 H+ + 6. O2 → Biliverdin + 8 AMP + 8 PPi + 8 NADP+ + 6 Fdox + H2O2 + 15 H2O + 4 NH3 + 6CO2 + CO. The ΔG0′ of the whole reaction was − 3108.60 kJ/mol and this value was 447.22 kJ/mol less than the value from the protoporphyrin-dependent heme biosynthesis pathway (Fig. 1b and Table 1). Therefore, it was a more thermodynamically favorable reaction and used fewer products such as S-adenosyl-l-methionine. Based on this information, Cgl1899 in C. glutamicum was selected as a putative hemQ gene as part of the pull module using BLAST. Crude enzyme extract assays of HemH and HemQ were performed to identify the functional activity of HemQ using HM004, HM005, and HM006 that harboring pMTZ, pMTZ-hemH, and pMTZ-hemQNAT, respectively (Fig. 3). When HemH and HemQ of C. glutamicum were assayed with coproporphyrin III, 8.55 ± 0.45 μM of heme, 3.08 times higher than no enzyme expression, was accumulated, confirming that HemQ (Cgl1899) has functional activity. Furthermore, crude extract assays with protoporphyrin IX were performed to compare the protoporphyrin dependent pathway and coproporphyrin dependent pathway. When HemH alone or HemH and HemQ were assayed with protoporphyrin IX, the amount of heme was not significantly increased compared with the results using coproporphyrin III as a substrate. Based on the results, we confirmed the possibility of hemQ-mediated coproporphyrin dependent pathway in C. glutamicum and hemQ was selected as a pull part to produce biliverdin. To identify the effect of combination of push and pull parts, pMTZ-hemQNAT carrying the native hemQ (Cgl1899) gene that uses GTG as a start codon was constructed and cotransformed with pEKEx2-hemAL (named HM007). The HM007 showed a similar growth pattern but the specific growth rate was increased to 0.18 ± 0.01 h− 1 compared with HM002 (Fig. 4a). As the hemQ gene was added, heme production was increased to 17.66 ± 0.42 mg/L and coproporphyrin III was decreased to 1.14 ± 0.01 mg/L in the HM007 strain (Fig. 4d). To increase HemQ activity, pMTZ-hemQ carrying Cgl1899 with a change of the GTG start codon to ATG was constructed (named HM008). The HM008 represented a similar growth pattern but produced 27.22 ± 0.65 mg/L of heme, 9.56-fold and 1.74-fold increase compared with HM001 and HM002, respectively (Fig. 4b and e). It produced 1.42 ± 0.07 mg/L of coproporphyrin III and 6.78 ± 0.54 mg/L of uroporphyrin III. However, biliverdin was not detected even though precursors were supplied. Because all recombinant strains only produced negligible amounts of biliverdin, the hmuO gene from C. glutamicum was selected as another part of the pull module and cloned into pMTZ, generating pMTZ-hmuO. The BV001 strain was developed by coexpressing pEKEx2-hemAL and pMTZ-hmuO. During cultivation, the cell growth pattern of the BV001 strain was similar to that of other strains (Fig. 4c). 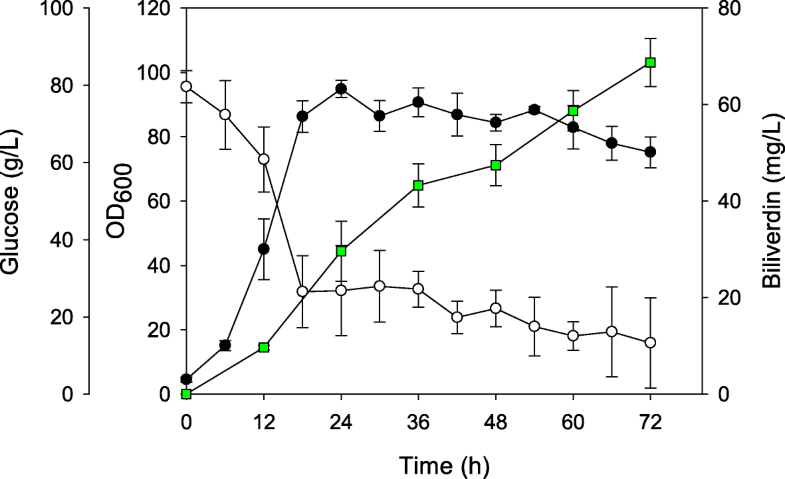 However, it consumed all of the glucose at 28 h while other strains did this at 24 h. During 60 h batch cultivation in a 500 mL baffled flask, 7.37 ± 0.40 mg/L of biliverdin was produced (Fig. 4f). Compared to HM002 that had only a push module, heme which is a direct precursor of biliverdin was decreased to 7.93 ± 0.29 mg/L. Decreased amounts of uroporphyrin III (4.25 ± 0.62 mg/L) and coproporphyrin III (3.27 ± 0.37 mg/L) were also detected. These results showed that the BV001 strain has the potential for production of biliverdin, but more genetic engineering was needed to supply precursors. On the basis of the results, we speculated that the utilization of both hemQ and hmuO as part of the pull module could produce biliverdin more efficiently (Fig. 5a). BV002 harboring pEKEx2-hemALQ and pMTZ-hmuO was constructed and produced 9.39 ± 0.22 mg/L of biliverdin, which was 1.27-fold higher than the BV001 strain (Fig. 5b). Furthermore, another three strains that had both push parts (hemAM and hemL) and pull parts (hemQ and hmuO) with different genetic arrangements were developed. The BV004 strain harboring pEKEx2-hemAL and pMTZ-hemQO gave better production of biliverdin than the other strains. At 60 h, the BV004 strain produced 11.38 ± 0.47 mg/L of biliverdin, while 9.14 ± 1.79 mg/L of heme remained (Fig. 5b). Meanwhile, 10.93 ± 0.23 mg/L and 6.00 ± 0.27 mg/L of biliverdin were produced in BV003 and BV005, respectively, while 11.04 ± 0.16 mg/L and 15.09 ± 1.32 mg/L of heme had accumulated, respectively. As shown in Additional file 1: Figure S1, four different modules produced different concentrations of uroporphyrin III and coproporphyrin III, but protoporphyrin IX was still not detected. In addition, the biotin concentration was optimized in BV004 culture for enhanced biliverdin production. Biotin limitation is one of the storage tactics in C. glutamicum for the overproduction of glutamate which is an important precursor for biliverdin production. Nevertheless, the concentration of biotin should be optimized because a low level of biotin could inhibit the growth of C. glutamicum which is a biotin auxotroph . For the optimization of biotin concentrations, C. glutamicum BV004 was cultivated in modified CGX medium with eight different biotin concentrations: 1 μg/L, 5 μg/L, 20 μg/L, 50 μg/L, 100 μg/L, 200 μg/L, 300 μg/L and 500 μg/L (Table 2). BV004 had similar growth patterns when cultivated with biotin concentrations from 20 μg/L to 200 μg/L, and the final OD600 reached almost 50. A total of 1 μg/L and 5 μg/L of biotin had a lower final OD600 (40.12 ± 0.22 and 49.80 ± 0.63), but 300 μg/L and 500 μg/L of biotin had a final OD600 up to almost 59. Among the different concentrations of biotin, BV004 cultivated with 200 μg/L produced the highest biliverdin titer, which was 11.38 ± 0.47 mg/L. To evaluate the ability of the BV004 strain that produced the highest concentration of biliverdin among all strains, scaled-up fed-batch cultures were carried out in 5 L bioreactor to produce biliverdin (Fig. 6 and Additional file 1: Figure S2). Based on the optimization of the biotin concentration, 200 μg/L of biotin was used in fed-batch fermentation (Table 2). Starting with 80 g/L glucose as the sole carbon source, total 183.02 ± 7.53 g of glucose was consumed. During fed-batch fermentations, 68.74 ± 5.00 mg/L of biliverdin was produced, which is the highest titer using microbial cell factories to the best of our knowledge. The yield and productivity were 0.84 ± 0.07 mg/g glucose and 0.95 ± 0.07 mg/L/h. Biliverdin has attracted increasing interest due to its wide application in various fields. In particular, it has become apparent that biliverdin is one of the recyclable antioxidants such as glutathione and it is expected that a lower amount of biliverdin was needed for reducing ROS compared to other antioxidants because of its recyclability [2, 3]. In this study, we developed recombinant C. glutamicum strains for the efficient production of biliverdin via novel coproporphyrin dependent pathway. Even though C. glutamicum is known to have heme oxygenase, biliverdin was not detected during the culture of the wild type strain. Thus, we introduced a rational push and pull strategy with in vitro thermodynamic analysis to produce biliverdin. The strategies used in this study were as follows: (i) overexpression of hemAM and hemL as push parts based on thermodynamic data; (ii) discovery of unnoted hemQ as a pull part after comparison of known hemN and hemQ; (iii) overexpression of hmuO as a pull part; (iv) modular optimization of push and pull modules; and (v) fed-batch fermentation to a scalable production of biliverdin using a proper biotin concentration. The push and pull strategy is one of the logical tactics to produce targeted materials and it has been used in many biosystems such as Yarrowia lipolytica , Saccharomyces cerevisiae  and E. coli . Briefly, ‘push’ means the overexpression of enzymes that are recognized as bottlenecks in pathways and ‘pull’ means the overexpression of terminal enzymes. This strategy minimizes target genes overexpression for the efficient production of materials. Overexpression of essential enzymes, rather than all of the related enzymes, avoids metabolic burdens and excessive use of antibiotics . Moreover, it is more important in the heme biosynthesis pathway because the enzymes related to this intricately regulated pathway influence the mRNA expression levels of one another . In the case of E. coli, the overexpression of hemD upregulated almost all of the enzymes in the heme biosynthesis pathway. Conversely, the overexpression of enzymes such as hemB or hemG reduced the relative mRNA expression levels of other enzymes. Candidates for the components of the push and pull strategy are commonly selected based on many studies on the related enzymes but there were a few articles on the biliverdin biosynthesis pathway in C. glutamicum. Therefore, we primally introduced in vitro thermodynamic analysis of all enzymes that were related to the pathway [37, 38]. This analysis provided information on the thermodynamic stability of enzymes using the calculation of Gibbs free energy. Enzymes with higher Gibbs free energies are thermodynamically unfavorable and have greater possibilities to act as rate-limiting steps in pathways [39, 40]. 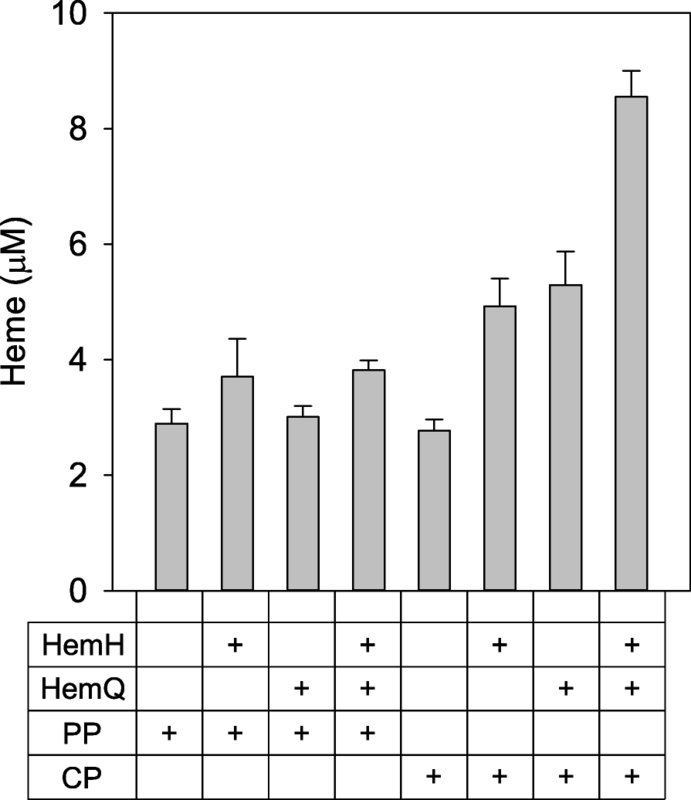 The success of the overexpression of genes based on the calculations in this study corresponded with previous studies that overexpressed hemA and hemL or hemH for heme production [41, 42, 43]. Therefore, hemH can be a tempting candidate for further studies to enhance heme production in C. glutamicum. The result that the overexpression of hemN negatively effects heme production is noteworthy (Fig. 2f). We speculated on the existence of a hemQ-mediated pathway because protoporphyrin IX is not detected in C. glutamicum despite hemN overexpression. The result that C. glutamicum does not use protoporphyrin IX but instead uses coproporphyrin III for heme makes C. glutamicum a reasonable microbial cell factory to produce materials related to heme. There are some different enzymes related to the protoporphyrin-dependent pathway that use different cofactors . For example, in the case of E. coli, hemF and hemG can replace hemN and hemY, respectively (Additional file 1: Table S1). There are five methods for producing heme from coproporphyrinogen III. Based on the calculation of the Gibbs free energies, the reaction using hemY, hemH, and hemQ, as with C. glutamicum, has the greatest potential among the tested reactions. The ΔG0′ of this reaction was − 940.33 kJ/mol, and this value was at least 190.18 kJ/mol less than the other reactions. Moreover, it utilizes the least number of substrates for heme production. It only uses 1 mol coproporphyrinogen III, 3 mol oxygen, and 1 mol ferrous ion to synthesize 1 mol of heme, even though other methods need additional cofactors such as 5′-deoxyadenosines or menaquinones. Balancing the expression of gene rearrangements may be an important factor in producing materials in synthetic biology . The utilization of substrates or the production of targeted chemicals can be diverse even though the same genes were overexpressed [45, 46]. A pEKEx2 vector that contains a pBL1 origin and a pMTZ vector that carries a pCG1 origin produce moderate copy numbers of plasmids, but a pBL1 origin produces a slightly higher copy number per cell than a pCG1 origin . Four different strains were constructed with different gene arrangements using the pEKEx2 and pMTZ vectors (Fig. 5a). All strains, except for BV005, produced more biliverdin than the BV001 strain. Interestingly, BV005 showed similar production of biliverdin compared to the BV001 strain. It seems that the order of genes is one of the important factors because of various translation levels in a synthetic operon . Modular optimization may be important in the heme biosynthesis pathway because it is tightly regulated and related genes affect each other. Despite using the same genes, such as hemAM, hemL, hemD, and hemF, 5-aminolevulinic acid production was 180 times different depending on modular optimization in E. coli . Apart from the biliverdin concentration, uroporphyrin III also seemed to be influenced by gene arrangements. In the heme biosynthesis pathway, uroporphyrinogen III is converted to coproporphyrinogen III by hemE or is spontaneously changed to uroporphyrin III without an enzymatic reaction. 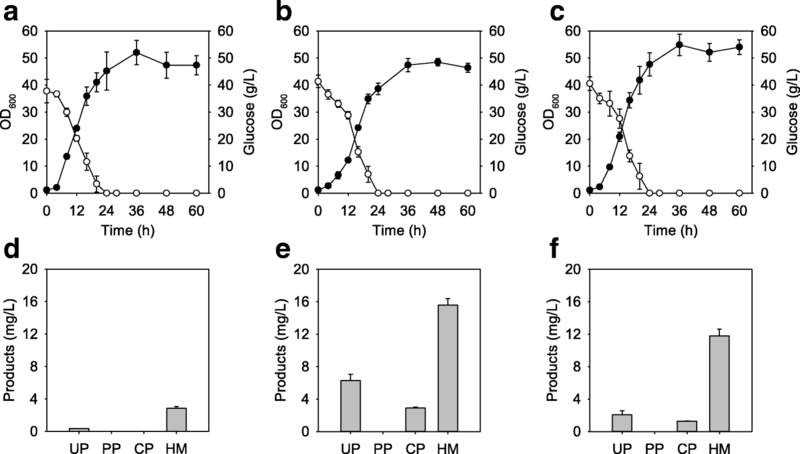 The amount of accumulated uroporphyrin III is highly affected by the overexpression of genes related to the heme biosynthesis pathway in E. coli . When hemB, hemC, and hemD genes were overexpressed in E. coli, uroporphyrin III was increased to 4.67-, 2.17-, and 17.5-fold compared to the control strains, respectively. Likewise, the overexpression of hemQ with hmuO using a moderate copy number vector seems to highly affect the concentration of uroporphyrin III. BV004 and BV005 in which hemQ and hmuO were overexpressed with the pMTZ vector accumulated almost 20 mg/L of uroporphyrin III, while other strains produced nearly 5 mg/L of uroporphyrin III (Additional file 1: Figure S1). 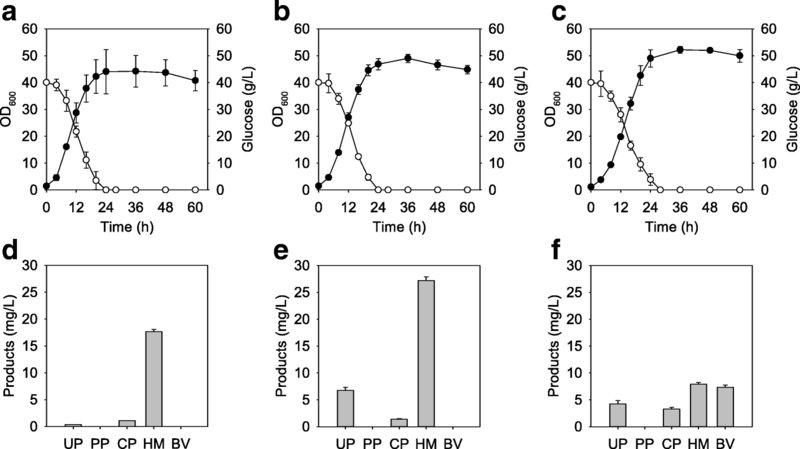 Therefore, hemE that strengthens the carbon flow to coproporphyrinogen III and reduces accumulation of uroporphyrin III can be a reasonable candidate for further studies. In summary, we suggested the possibility of C. glutamicum as a reasonable biosystem to produce biliverdin. We demonstrated the existence of the coproporphyrin dependent pathway in C. glutamicum and produced the highest titer of biliverdin using this pathway. 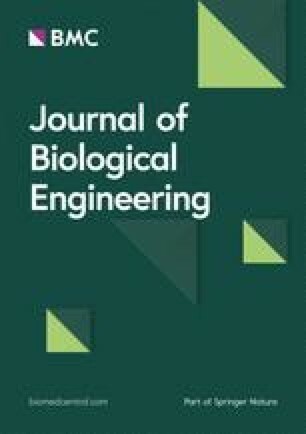 Based on this study, further improvements in upstream bioprocessing, such as rerouting the carbon flux of the TCA cycle and introducing a novel pathway to produce more precursors, and downstream bioprocessing, such as developing an efficient purification method, will be necessary for the industrial utilization of biliverdin. All bacterial strains and plasmids used in this study are listed in Table 3. All primers used in this study are presented in Table 4. E. coli DH5α was used as the host for gene cloning and plasmid construction, and C. glutamicum ATCC 13826 was used as the host strain to produce biliverdin. For the two-vector system of C. glutamicum, pMTZ vector was constructed by replacing the kanamycin resistance gene of pMT-tac with a zeocin resistance gene from pPsADHα by digestion with SalI and SnaBI. The hemN, hemH, hemQNAT, hemQ, and hmuO genes were amplified from the genomic DNA of C. glutamicum. To construct plasmids pMTZ-hemN, pMTZ-hemH, pMTZ-hemQNAT, pMTZ-hemQ, and pMTZ-hmuO, the hemN, hemH, hemQNAT, hemQ, and hmuO genes were amplified using primers N-F/N-R, H-F/H-R, QNAT-F/QNAT-R, Q-F/Q-R, and O-F/O-R, respectively. The amplified genes were digested with ClaI/NotI (hemN, hemH, hemQNAT, and hemQ) and ClaI/BamHI (hmuO) and cloned into plasmid pMTZ. To construct plasmids pEKEx2-hemALQ and pEKEx2-hemALO, hemQ and hmuO genes were amplified using primers ALQ-F/ALQ-R and ALO-F/ALO-R, respectively. The amplified genes were digested with BamHI/KpnI and cloned into plasmid pEKEx2-hemAL. To construct plasmids pMTZ-hemQO and pMTZ-hemOQ, hmuO and hemQ genes were amplified using primers QO-F/QO-R and OQ-F/OQ-R, respectively. The amplified genes were digested with NotI/NotI (hmuO) and BamHI/NotI (hemQ) and cloned into plasmid pMTZ-hemQ and pMTZ-hmuO, respectively. The Gibbs free energies for the compounds involved in the pathway to produce biliverdin were obtained from MetaCyC . Net changes in the Gibbs free energy for each reaction were calculated using the equation ΔG0′ = Σ(G0′products) − Σ(G0′substrates). The values given in kcal/mol were converted to kJ/mol (1 kcal/mol = 4.184 kJ/mol). LB medium (10 g/L NaCl, 10 g/L tryptone, and 5 g/L yeast extract) was used for molecular genetic procedures. BHIS medium (37 g/L brain heart infusion and 91 g/L sorbitol) was used for the preculture of C. glutamicum. Modified CGXII medium consisting of 42 g 3-morpholinopropane-1-sulfonic acid (MOPS), 20 g ammonium sulfate, 5 g urea, 1 g potassium dihydrogen phosphate, 1 g potassium phosphate dibasic anhydrous, 1 g calcium chloride anhydrous, 0.25 g MgSO4·7H2O, 10 mg CaCl2, 10 mg FeSO4·7H2O, 1 mg ZnSO4·7H2O, 0.2 mg biotin, 0.31 mg CuSO4·5H2O, 0.1 mg MnSO4·H2O and 0.02 mg NiCl2·6H2O per liter was used for the culture of C. glutamicum with glucose as a sole carbon source. When appropriate, kanamycin (50 μg/mL for E. coli or 25 μg/mL for C. glutamicum), ampicillin (100 μg/mL) or zeocin (25 μg/mL) was added to the medium. Cells were inoculated into 100 mL baffled flasks containing 20 mL BHIS medium and were cultivated at 30 °C for 12 h with 150 rpm. The precultures were transferred to 500 mL baffled flasks containing 100 mL modified CGXII medium with 40 g/L glucose and 1 mM Isopropyl β-d-1-thiogalactopyranoside (IPTG) at an initial OD600 of 1. Then, cells were cultivated at 30 °C for 60 h with 150 rpm. Cells were inoculated into 100 mL baffled flasks containing 20 mL BHIS medium and were cultivated at 30 °C for 12 h with 150 rpm. The first precultures were transferred to 1 L baffled flasks containing 200 mL BHIS medium and were cultivated at 30 °C for 12 h with 150 rpm. The second precultures were washed once with modified CGXII medium and were transferred to 5 L bioreactor containing 1.8 L modified CGXII medium with 80 g/L glucose and 1 mM IPTG. Temperature, agitation, and aeration rate were maintained at 30 °C, 600 rpm, and 2 vvm, respectively. The pH was maintained at 7.0 by automatically adding 10% H3PO4 and 4 N KOH. When the glucose concentration decreased to approximately 20 g/L, 50% glucose was added to maintain the level of glucose at approximately 20 g/L. Foam was removed using 10% antifoam 204 (Sigma-Aldrich, USA). Bacterial cell growth was followed by measuring the optical density at 600 nm using a UV/Vis spectrophotometer (Mecasys Co., Ltd., Korea). The glucose concentration in the culture medium was measured with glucose assay kit (Sigma-Aldrich, USA). Porphyrin intermediates and heme concentrations were measured with a high-performance liquid chromatography (HPLC) system (Waters Corporation, USA) with a UV detector (Waters 2487) at 400 nm . The initial mobile phase composition was 20% solvent A (1:9 methanol:acetonitrile) and 80% solvent B (0.5% trifluoroacetic acid in water, pH 2.60). The solvent gradient consisted in 40 min linear change at 95% solvent A and 5% solvent B with 1.0 ml/min flow velocity at 40 °C. Biliverdin concentration was analyzed by HPLC system with a UV detector at 376 nm . The initial mobile phase composition was 25% solvent C (methanol) and 75% (1 M ammonium acetate, pH 5.16). The solvent gradient consisted of 8 min linear change at 95% solvent C and 5% solvent D, and then 2 min at these conditions and 8 min at 25% solvent C and 75% solvent D with 1.5 ml/min flow velocity at 70 °C. Cells were cultivated at 30 °C for 16 h with 150 rpm, harvested by centrifugation (4000 rpm at 4 °C for 20 min), washed twice in 66 mM Tris-HCl (pH 8.0). The cells were resuspended in same buffer and sonicated for 20 min. Cell debris was removed by centrifugation (4000 rpm at 4 °C for 20 min) and the supernatant was used to crude extract enzyme assays. The protein concentration was measured by Bradford method . The coupled assays of HemH and HemQ were performed as previously reported . The reactions were performed at 30 °C for 15 min in 66 mM Tris-HCl (pH 8.0) containing 3.3% Tween 20, 5 mM glutathione, 100 μM 2-mercaptoethanol, 100 μM ferrous ammonium sulfate, 25 μM substrate (protoporphyrin IX or coproporphyrin III), and 1 mg/mL crude enzyme extracts. We would like to express gratitude to School of Life Sciences and Biotechnology for BK21 PLUS, Korea University for processing charges in open access journals. This work was supported by the National Research Foundation of Korea (N.R.F.) with a grant funded by the Korean government (MSIP) (No. 2018R1A2B2003704). Gene sequences used in this project are from GenBank (http://www.ncbi.nlm.nih.gov/) and the material and data supporting their findings can be found in the main paper and Additional file. SOH supervised and coordinated this study. JS and SOH designed, performed most of the experiments and mainly wrote the manuscript. YJK and MEL participated in the research. YJK, MEL, JEH and SOH revised and edited the manuscript. All authors reviewed and approved the final manuscript.